Don't call it a fancy Accord. The TLX is so much more. A little bit of NSX supercar DNA can't hurt lagging sales of the TLX sports sedan, even more than the A-SPEC version (which is pretty good). 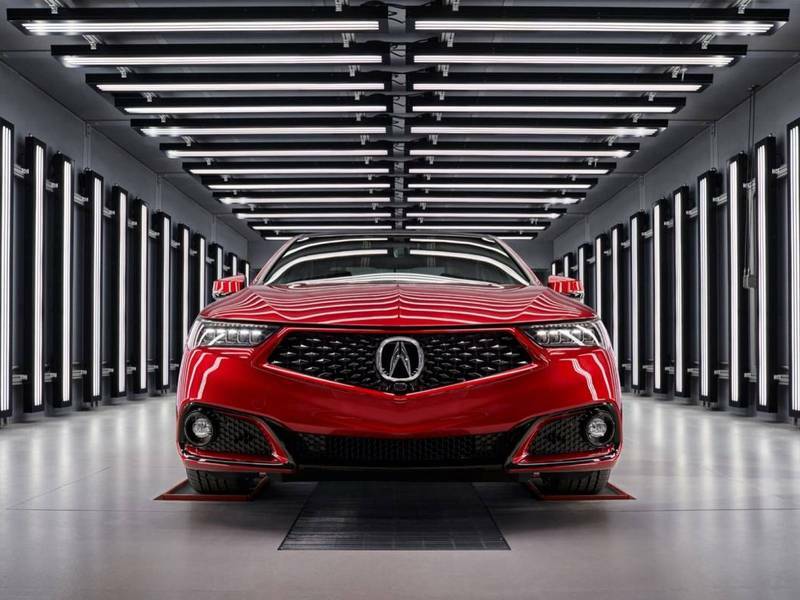 Now, the luxury arm of Acura wants to infuse the sedan with more excitement thanks to its Performance Manufacturing Center (PMC) located in Ohio. The TLX isn't a hot seller, but it is a very good car. The question is will the extra level of touch make the car sell any better? Let's hope so. The base car is an unpainted TLX body from the Acura production to the PMC. The car then gets a special paint known as Valencia Red Pearl that's normally only available on the NSX. The unique paint uses mica, metal flake, and super-high transparency nano pigments to give it its unique look, and then it gets two layers of clear coat for that high gloss sheen. The TLX PMC Edition gets the standard power from the TLX's i-VTEC V6 engine and the handling benefit of Acura Super-Handling All-Wheel Drive (SH-AWD), normally an option on the TLX. The interior and exterior styling is consistent with the sportier A-Spec, along with the TLX Advance Package that includes great features like Surround View Camera System, Wireless Charger, Front and Rear Parking Sensors, Remote Engine Start with Vehicle Feedback, and Rear Door Smart Key Entry. To further set the PMC Edition apart from even the A-Spec, there are special 19-inch gloss black split-5-spoke wheels that match the gloss black roof panel, door handles, and prominent diamond pentagon grille. Even the exhaust tips are black chrome. The highly-rated jewel-eye headlights are pulled from the A-Spec, as are body-colored side mirrors. IThe cabin is both sporty and luxurious thanks to heated/cooled black leather and Alcantara seats with red stitching. The sporty steering wheel, door panels, center console, and door armrests also get the red stitch treatment. The Acura ELS Studio 10-speaker premium audio system, Apple CarPlay/Android Auto, AcuraWatch, blind spot notifications, rear cross traffic monitor, and the surround view camera system all come standard, as well as a wireless charging tray. Oh, and don't forget that part of that $50K asking price also includes a special numbered plaque showing the special nature of your TLX PMC. A mere 360 versions of the PMC will be made for customers willing to pay $50,000 (the base TLX is $33,000, and the A-Spec is $39,400). That's a lot of coin, but keep in mind that the same builders who assemble the $157,500 NSX hybrid supercar are the same ones building the TLX PMC. The great thing is that this special model with the first but not the only one that gets the PMC treatment. The limited production TLX will show up at the New York Auto Show next week. Acura expects the 2020 TLX PMC Edition to be priced at around $50,000, when it goes on sale this summer. If you’re not in the market for a sedan, but do like the sound of a very limited-edition Acura, the good news is that this will just be the first of the PMC Edition cars. Next up will be an MDX PMC Edition, giving the automaker’s best-selling SUV the NSX treatment.